They say: Life’s a Beach….right? Every girl loves a fabulous floral print. I found the cutest wrap dress on Ebay for under $15. You can wear this all by itself or as a beach coverup. The simple bell sleeves and feminine ruffle at the bottom makes this a favorite option. My earrings and hat are from Nordstrom and add the perfect touch of glam. I’ve linked my accessories and similar wrap dresses below. 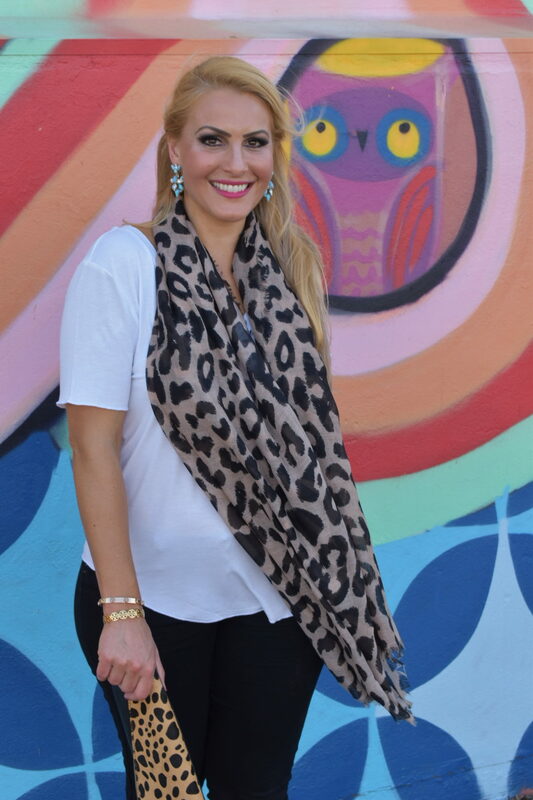 FALL STYLE: Who doesn’t love a great animal print? Accessories add so much character to your look. I believe you can look like a million bucks by only spending a few dollars on key pieces. This Nordstrom scarf is only $19 and that’s full price! You’ll be able to wear this for years and it will become a staple item in your fall wardrobe. Since this print is considered a neutral, it will match any color that you pair with it. I hope you try incorporating some new animal prints this fall. This trend is a classic! I’ve linked all outfit details.